If you need to set up a number of events with similar configurations, you can streamline the process using event templates. Assign a descriptive template title that clearly identifies the type of event this template is used for (e.g., Monthly community meetup with online registration). There are no starting and ending dates in the template form. That information will always be specific to an actual event instance. Click Events > Event Templates. 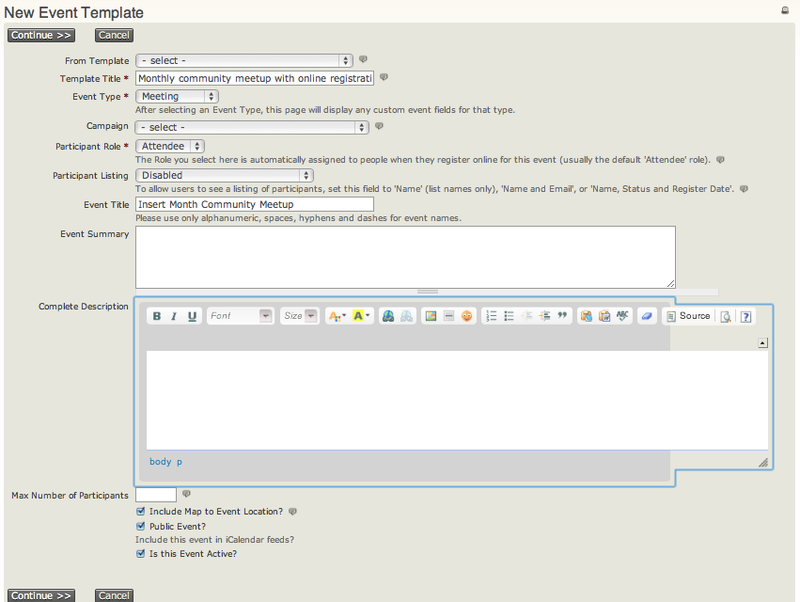 To create a template, start by navigating to Events > Event Templates and clicking Add Event Template. Enter template title and event type. Select campaign if all events created from this template should be associated with a campaign. Continue the normal event set-up process using the settings that will be constant for all events to be created using this template. Common characteristics might include location, event fees, online registration settings, tell-a-friend settings, etc. Once you've created an event template, you can select that template (as shown in the following screenshot) when you start to create a new event. Your event will be pre-filled with the saved configuration properties.